Losing weight the healthy way requires burning a fair amount of calories each week, in addition to reducing caloric intake. This poses a problem for many people because they feel they are too busy for long workouts. 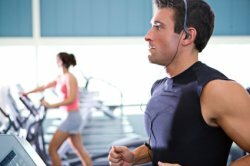 What they (and you) may not realize is that you don’t have to exercise for long periods of time all at once; you can split it up into several sessions a day and still burn the same amount of calories. Walking briskly (4mph speed) for 20 minutes burns about 117 calories for a 150 pound person. That may not seem like a lot, but if you did it 2 or 3 times a day, you’d burn a fair number of calories overall. If you were to climb stairs for 15 minutes, you’d burn approximately 137 calories. If you don’t have stairs at home or work, buy yourself a small stair step that you can use while watching TV. You don’t even have to step during your shows - wait for the commercials. A one hour television show is roughly 45 minutes long, and the remaining 15 minutes is filled with commercials. Use that time to your advantage! Just 15 minutes of doing sit-ups, jumping jacks, knee lifts, lunges, and squats can burn approximately 137 calories. Again, during commercials while watching television would be a great time, but you can do them anywhere you can find some privacy, even while on breaks at work. You can also burn a substantial amount of calories throughout the day if you simply make a commitment to be more active. Walk a little more, take the stairs more often, take the long way around the store while shopping . . . all of these little things add up, and it’s very possible to burn significant calories with a little bit of effort. Too Busy to Exercise? Time to Squeeze in Physical Activity!